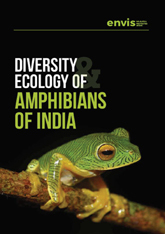 The ENVIS Bulletin on Diversity and Ecology of Amphibians of India Vol. 19 brought out by the Wildlife Institute of India, ENVIS Centre on “Wildlife & Protected Areas” was released by Shri H.S. Panwar, Former Director, WII during the XXXI Annual Research Seminar of Wildlife Institute of India held on 5 September 2017 in presence of Shri Ajay Narayan Jha, Secretary (EF&CC), MoEFCC; Dr. V.B. Mathur, Director, WII; Dr. G.S. Rawat, Dean, WII; and Shri P.R. Sinha, Former Director, WII and Chairman, WII-TRAC. Frogs, Toads, Salamanders and Caecilians collectively called as amphibians are evolutionary jewels hopping on this land since past 370 million years. They often tell us stories of continental drift, the rise of the great Himalaya, and the ecological interactions going on in our surroundings. With 417 amphibian species so far known from India, 75% are endemic. This special ENVIS issue has been edited by Dr. Abhijit Das, Scientist –C. This issue is an effort to collate scientific information needed for conservation of covert species such as amphibians. It contains 18 chapters under three sections that cover history, natural history, taxonomy, ecology, regeneration and reproductive biology and practices for amphibian conservation. For downloading this issue, please send email request to envis@wii.gov.in or Online Query to WII ENVIS Centre.